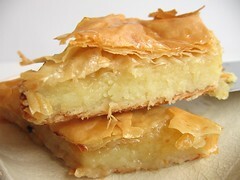 Mediterranean Phyllo-Semolina Pie - Do You Know The Muffin Man? Notes: The authors say this is a Lebanese dessert but don't give the name. I found recipes online for muhallebili baklava which don't use egg, and galaktoboureko which is pretty similar to the one in this book. I only used 10 layers each for the bottom and top so it wasn't very flaky. There are no flavourings (e.g. cinnamon, lemon zest, rosewater) so this version is a bit one-dimensional (along the ultrasweet axis).